In the meantime, we are off on our first road trip. 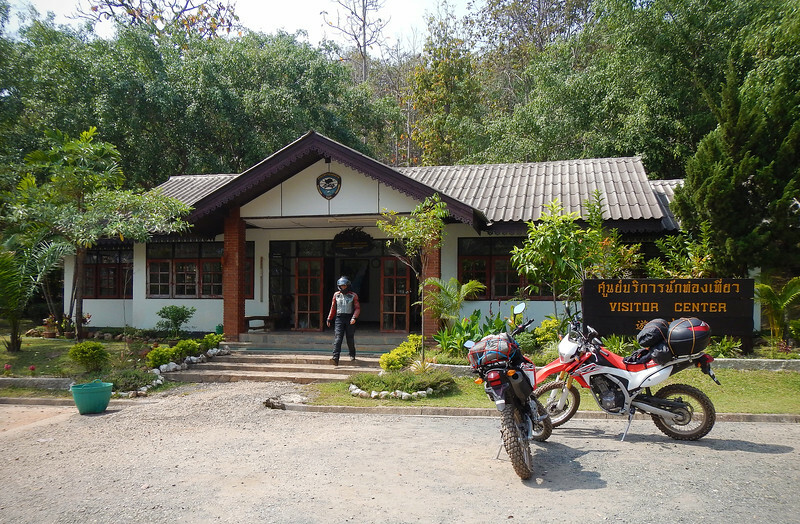 We're going to do the famous Mae Hong Son loop! 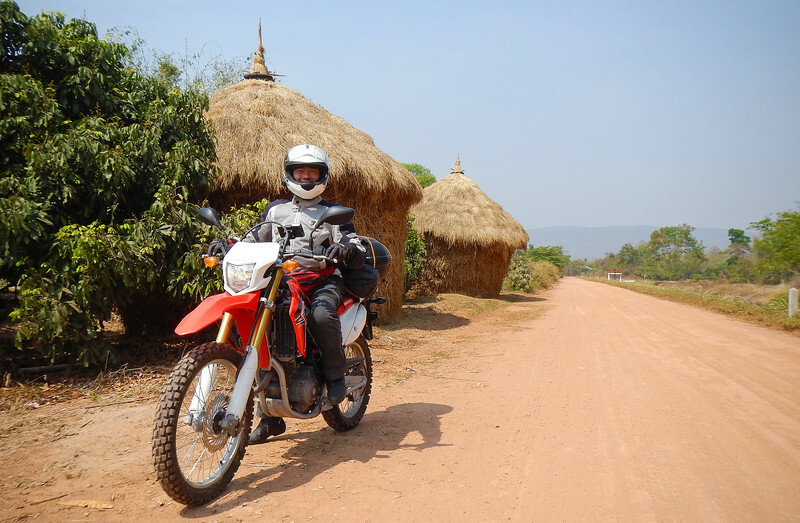 This ride will take us on the very twisty roads that wind through the jungles and mountains of North-West Thailand, skirting south along the border of Myanmar and then inland back up to Chiang Mai. I've read online that the entire 600km loop should take us 4 days to complete comfortably. When I read this out aloud to Neda, we both looked at each other and nodded in agreement: "So it should take over a week for us, then!" We are sadly saying goodbye to our amazing apartment in Nimman that's been home to us for the last three months. 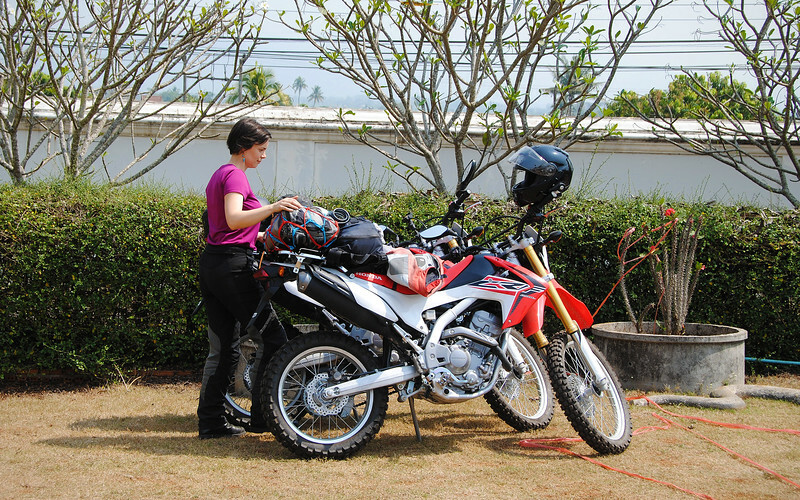 Everything we own in Thailand will be stuffed into drybags and loaded up onto the Hondas. Space is at a premium because we don't have the roomy box panniers that are on our BMWs, so the important stuff (documents, electronics) will go in my lockable and waterproof topcase and everything else will be strapped down to the seat behind us by all manner of bungie cords and nets. We have to get used to an entirely new system of packing, figuring out where to pack stuff that we need during the ride (rainsuits, food & water) vs stuff we won't use till we unpack for the evening. I expect we'll go through quite a few iterations of this before we get it optimized. Also we'll have to get used to a brand new game of Tetris as we jam our belongings in new configurations and try to memorize how and where everything fits every morning! So exciting! 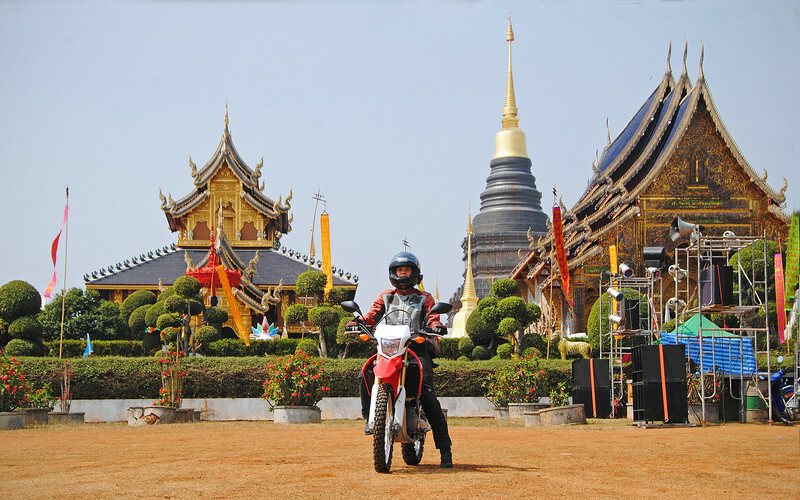 It's been months since we've traveled by motorcycle and we're eager to hit the road again. 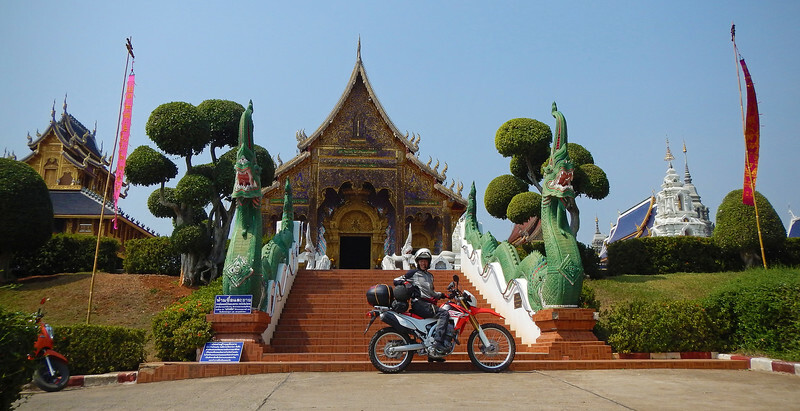 Hopefully our license plates will be waiting for us in Chiang Mai by the time we've finished the loop, because we want to continue exploring SE Asia after this short trip. Fingers crossed! 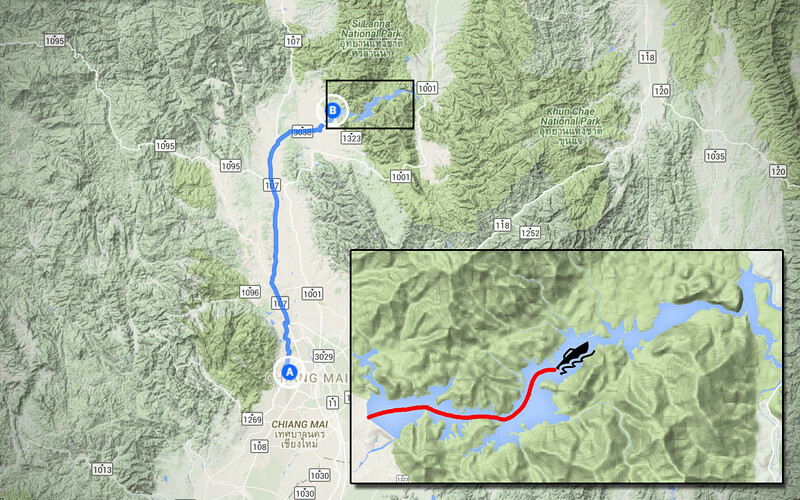 So true to form, we're already deviating from the Mae Hong Son loop on our first day. 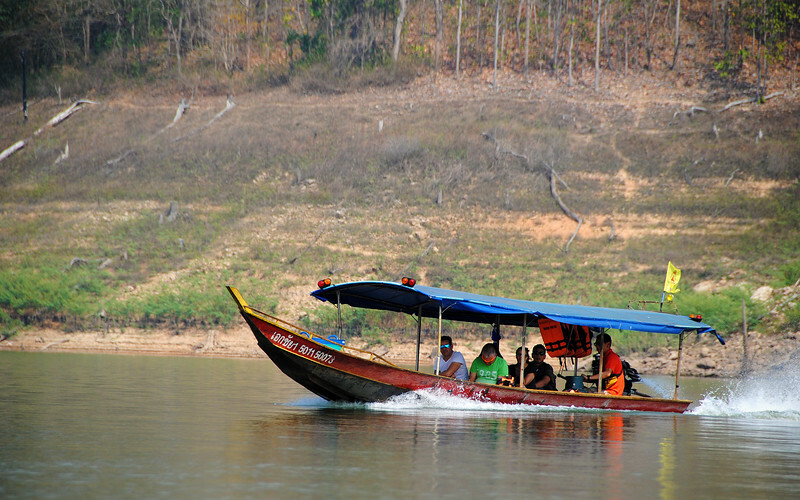 We're going to spend a day at the Mae Ngat Somboon Lake, which is actually a reservoir created by a dam at one end of the river. It's only 70 kms away. It's a fairly boring stretch. 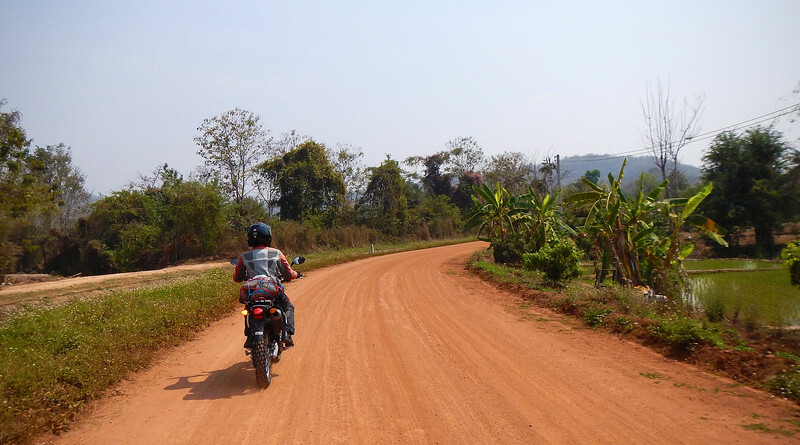 We loosely follow the Ping River north out of Chiang Mai, crawling through small towns and cities along the main road. The urban scenery scrolling past us for most of the way until we reach the turnoff for the lake. 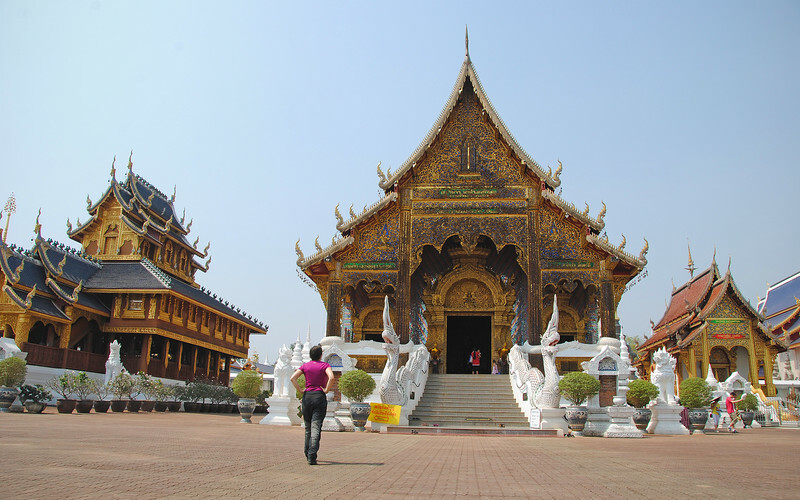 Then we saw the signs for Wat Ban Den. Oooh, we have to check this out! I love discovering stuff along the way! I'm a bit wary about parking the bikes with all our drybags unprotected on the back of our bikes as we walk around, but they're only clothes. I think the drybags themselves would be the hardest things to replace here in Thailand! Cool elephant/dragon monsters with antlers! Back to the bikes. And everything is still there. *phew*! 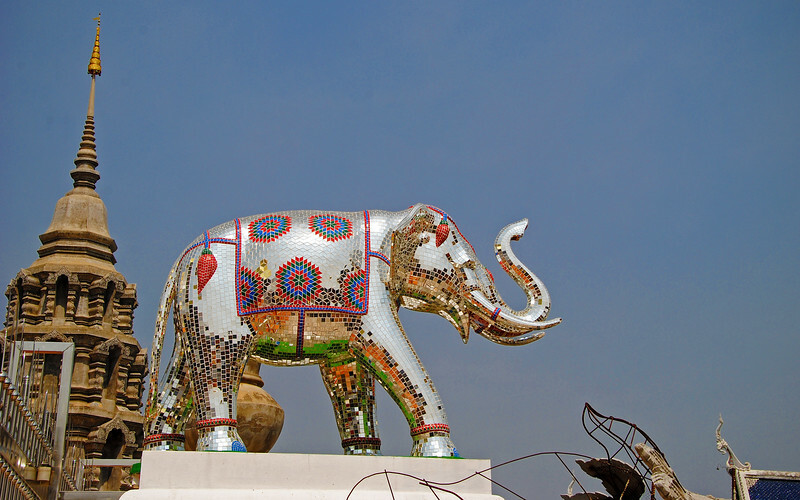 I suppose it would be bad karma to steal anything right in front of a temple? 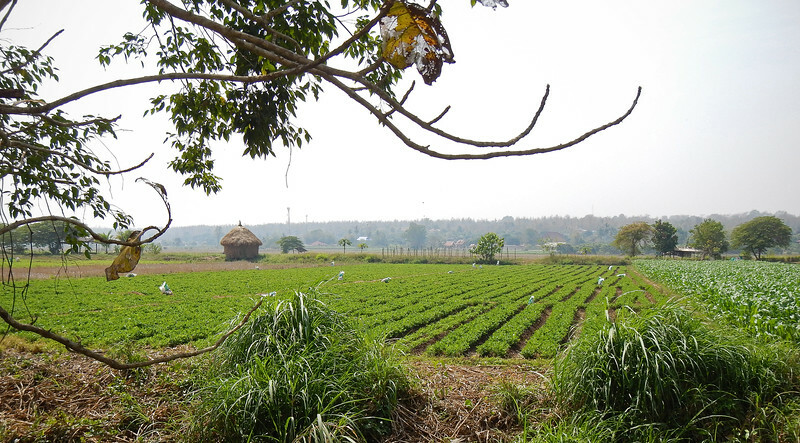 Our route takes us through large tracts of farmland which is much more scenic now that we're off the main road. I think we're lost. My GPS knows where the dock is, but the map is incomplete so I'm now navigating by eyeballing where we are and where we should be and choosing the most direct way there. This takes us through fields and farms. At one point, we have to stop and ask for directions. We spot a farmer by the side of the road. He's watching these two lost farangs on motorcycles with equal parts amusement and curiousity. Out here I know that there's 0% chance that he speaks any English. Thankfully, Neda has previously downloaded an app for her iPhone that has an off-line Thai/English dictionary. It also comes with a speech module, so we type out "boat" and "dock" and have the phone speak it to the farmer. His face lights up and he nods and points to another dirt path that we had missed earlier. I love technology! We say our Khob Khun Khraps (thank yous) and wave goodbye to him as we set off to the docks. These little huts on the farms are like the Croatian Kazuns! 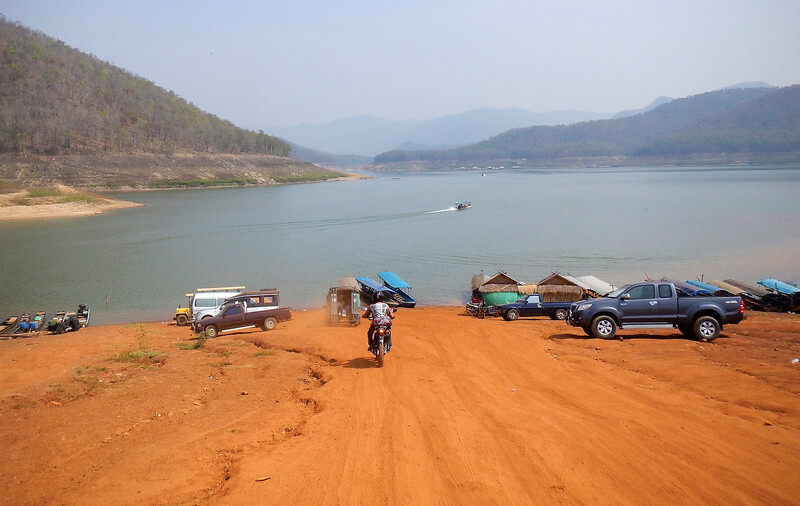 We made it to the Mae Ngat Somboon Lake! So it turns out there was a paved road to get here, but my GPS took us the shortest way through the fields. Neda read there was an admission fee to the Si Lana National park that the lake is located on, so she goes in to pay while I stay with the bikes to protect them (which really means I stay outside and take lots of pictures). Almost immediately she comes out. There's no one there. *shrug* okay! Free admission! I think it's because it's the middle of the week, so not many tourists now. 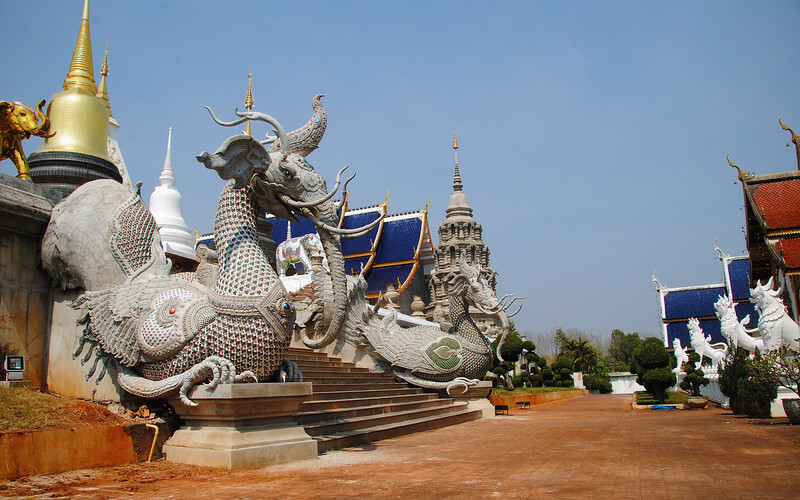 I think most visitors take a taxi or tuk tuk to get here. There's not a lot of parked vehicles down here. We just stick our bikes behind the huts and hope they will still be there when we return. 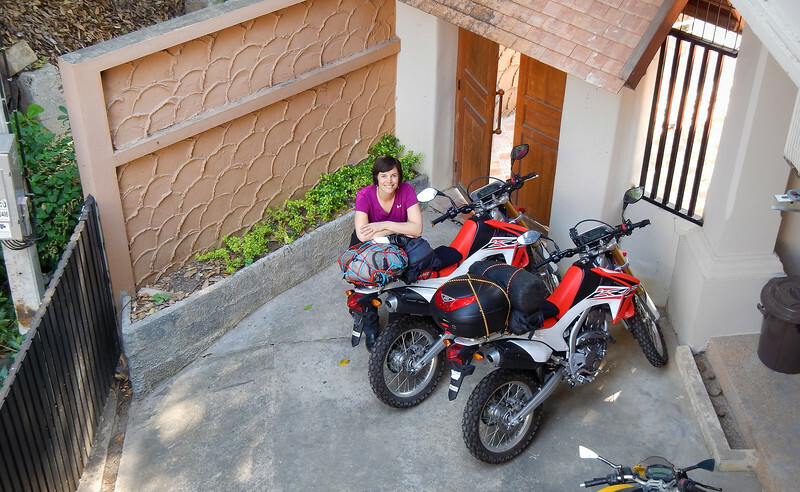 I think I'm being overly paranoid about the security here in Thailand, but it's our first road trip with these motorcycles, so I don't really know what to expect. Neda listens to me clucking on about locking everything up, "Don't worry so much, it'll be fine!" 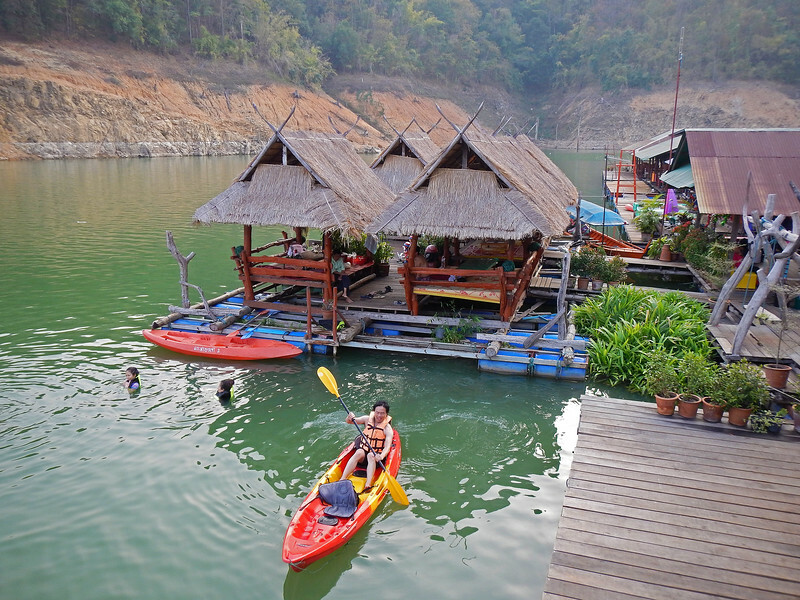 The coast of the artificial river is sparsely lined by houseboats, floating accommodations that you can stay overnight in and hang out and swim in the lake during the day! 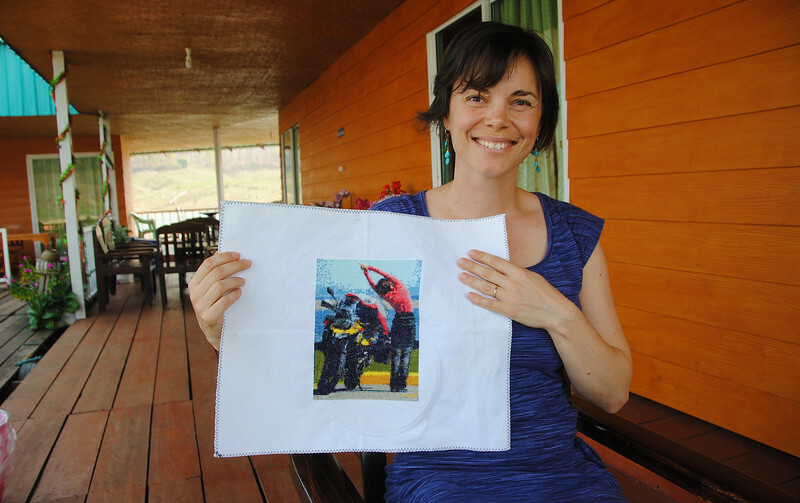 The most popular houseboat that was recommended online was fully booked, so Neda just chose another one by random. We're a bit worried because it has no reviews. I guess we'll find out what we signed up for soon! 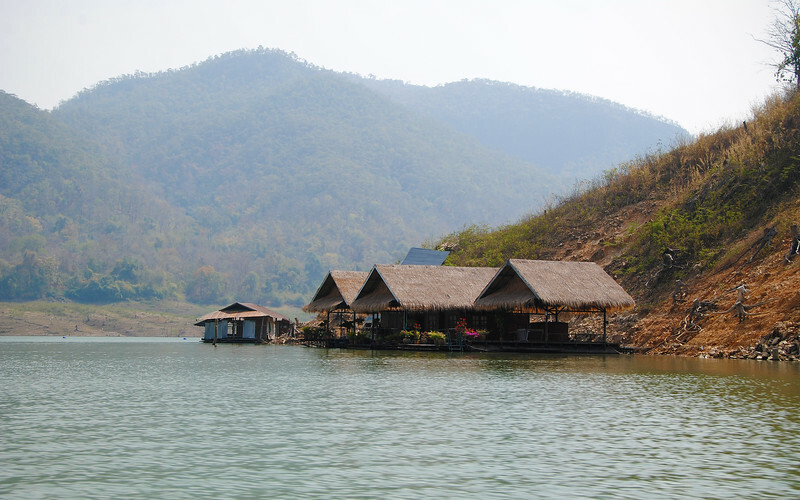 There are quite a few houseboats on the lake, all of differing standards - some run-down, some really nice-looking. 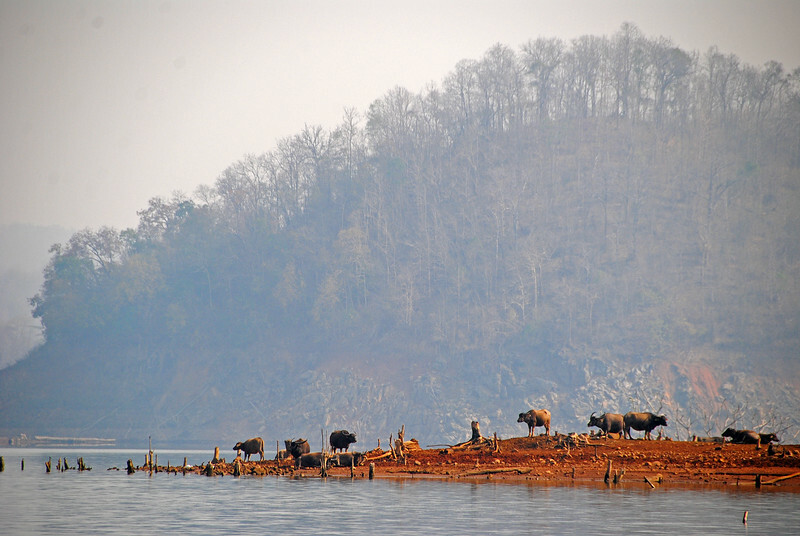 It's not a perfect blue-sky/clear-water day here on Mae Ngat Somboon Lake. The smoke from burning season has tinged the air just a few shades more opaque and the water in the reservoir almost matches the sky. Everytime we approached a nicer-looking houseboat, I secretly hoped that our longboat would stop in front of it. But, it always passed those nicer ones... :( And then when we approached the decrepit-looking ones, I also hoped the longboat would not stop in front of those... 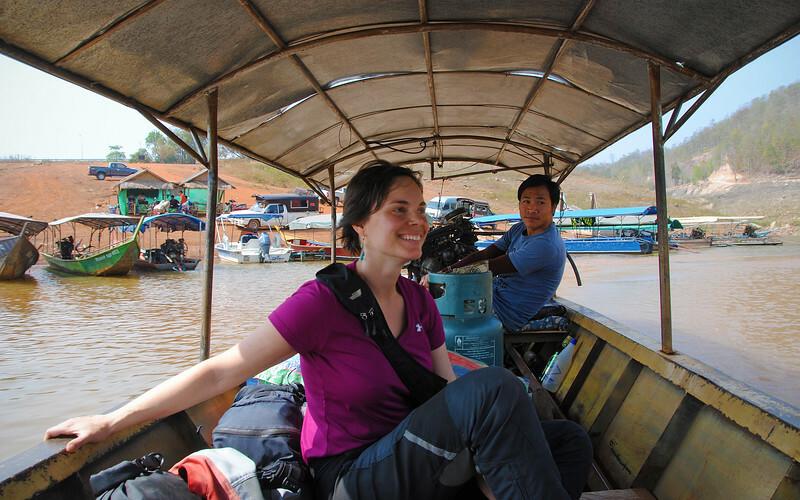 In the end, we ended up docking at what looks to be a middle-of-the-road houseboat. Not run-down, but definitely not as nice as some others along the lake. :( We have to plan ahead a lot earlier the next time we do this! 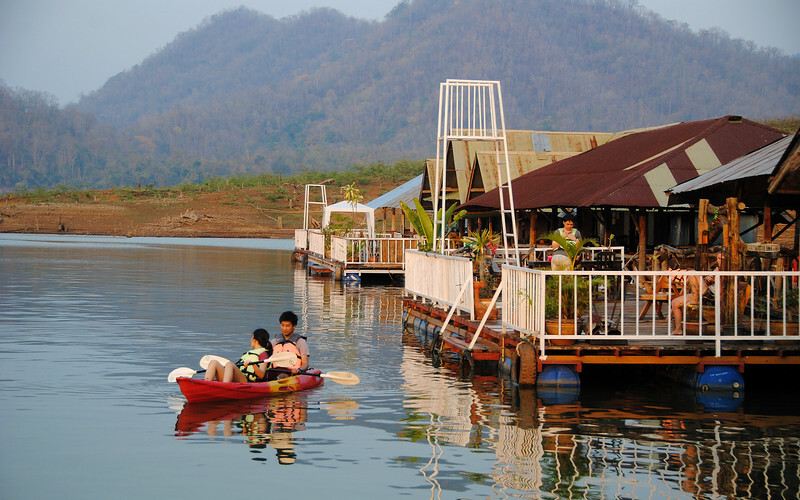 On each houseboat, there's a restaurant, some recreational facilities like kayaking, a platform to jump into the lake and some snorkeling equipment. 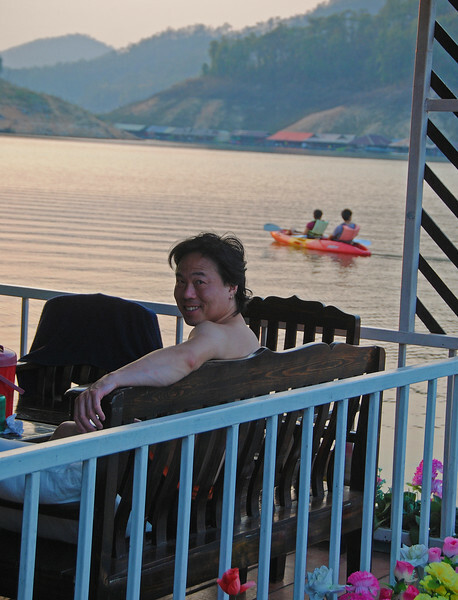 But the main activity here is definitely resting and relaxation. 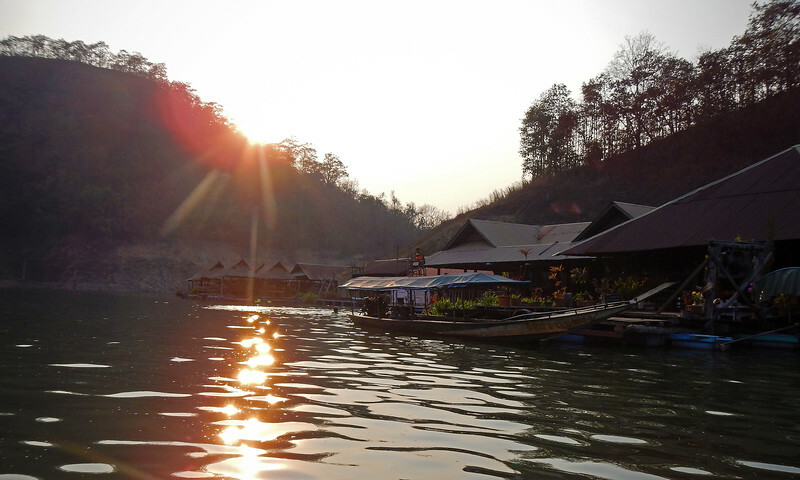 Staying on a houseboat is quite a unique experience. Although the houses are securely moored so there's very little rocking on the waters, the tin roof at our place flexes and creaks which gives us a bit of "soundtrack" for when we're trying to fall asleep. We can also look through the gaps between the wooden floorboards and watch fishes swimming in the lake directly below us. From our bed! We're hanging out and sleeping on a house on the water. How cool is that? Oh yeah, there's also animals for Neda to pet! Voila! It only took six months to complete!!! She's so proud of it! Doing what I do best: nothing. 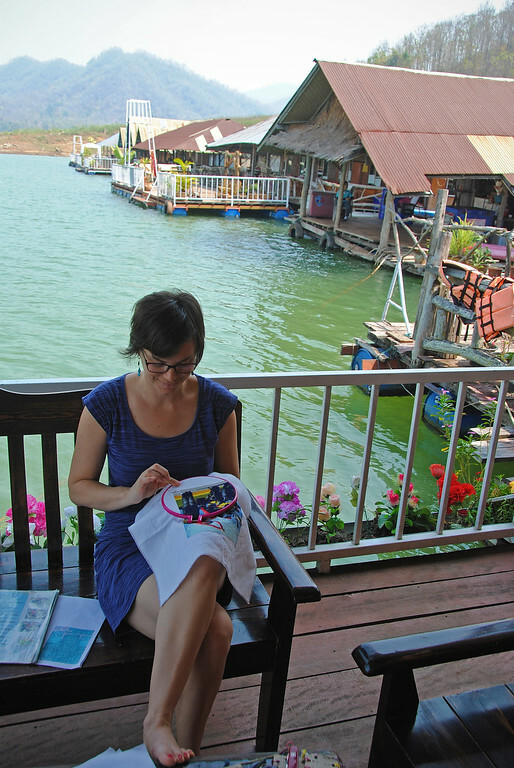 Our houseboat has no Wi-Fi, so I have a lot of time on my hands to organize all the pictures I've taken in Thailand and jot down a few blog posts to upload when we get back to civilization. I'm slowly getting caught up! Neda and I take one of the houseboat's kayaks out and we paddle out to the opposite shore to where we saw some of the nicer houseboats. We've only booked one night in our current place and we thought we could knock on a few doors in person and see if there are any vacancies. Then maybe we could switch for the next evening. 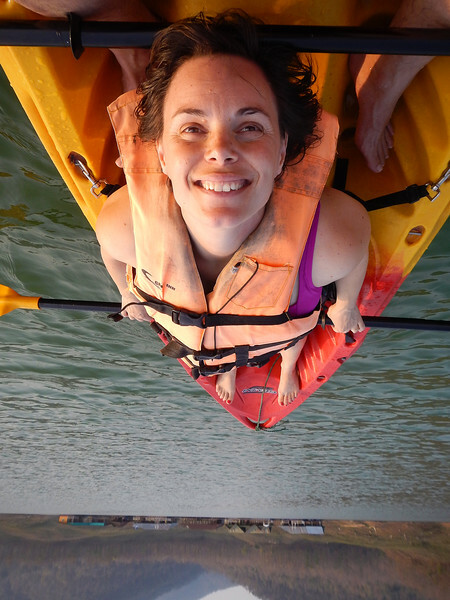 Is it bad of us to use their kayaks to shop for a new place to sleep? 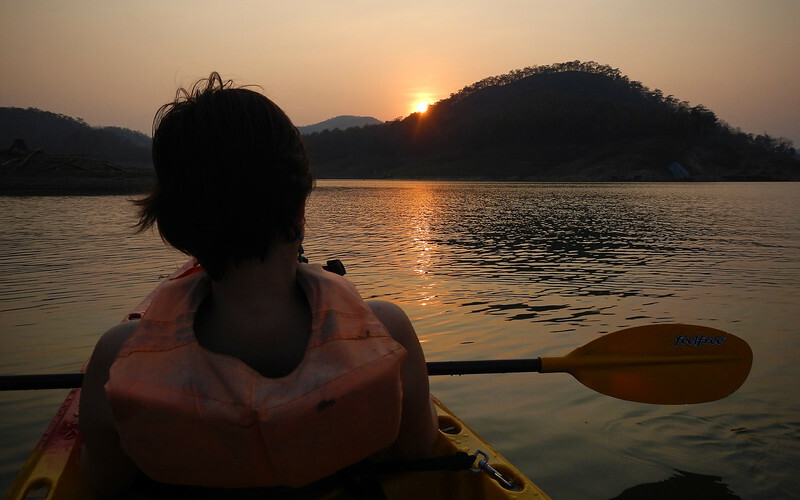 Watching the sunset on the lake. Very relaxing. As the sun sinks below the horizon, we stare at the lights from the houseboats across the lake reflecting off the water. But what really captivates us are the the fields on fire on the hills around the lake. 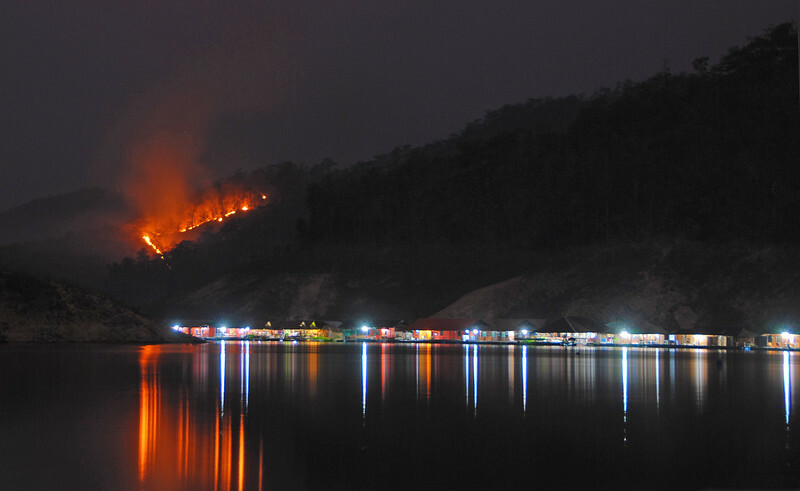 Burning season has become much more vivid at night-time. This is what we'll have to ride through in the next few days!